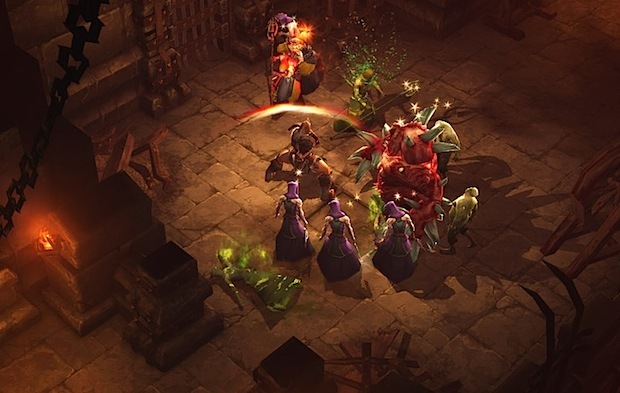 Diablo 3 has a release date set for May 15, and if you’re like us you’ve been wondering if your computer can handle the game well enough to be worth buying. The good news is that Blizzard looks to be supporting a wide array of hardware, and most fairly modern computers will run the game just fine. As usual, the newer and better your computer the better, but here are the minimum and recommended specs for Diablo III running on Mac and Windows PC’s. You’ll probably want to check against this before pre-ordering or buying the game. A note for Mac users: you will often get better gaming performance by playing in Windows, though this will require Boot Camp and a Windows partition to be able to do. The system requirements will be the same if you choose this route. Will this one run on my mbp mid 2010 with 2,4 GHz Intel Core 2 Duo, 4gb ram and the GeForce 320M 256 MB ? I’m sure it will. I had that same model and was pleasantly impressed with graphics performance. You may want to run at a lower res and lower graphics but it should play just fine. I played L4D, L4D2, and Portal2 in Win7 under boot camp and it ran ALOT better than the OSX native versions. That said StartCraft II ran fine in OSX and was completely playable. I don’t think you’ll have any problems playing in either Win7 or OSX. If you don’t want Windows or to play any “Windows Only” games than just stick with the OSX version. Hope this helps. Sorry here is a better list. Is this a list of graphic cards that will work? We will see. I have the same and, unfortunately, I cannot play DII on 10.7. as power pc si no longer supported. I think enough of RAM and VRAM should help a bit as well as CPU speed. It is still good we can play it. There’s even many unsupported graphic cards. Which is pretty strange/lame, considering my model is from early 2011. Just one year old and it’s not even garanteed to run DIII at high? So given that it’s available in both OS’s does anyone have a theory about which OS will be better to use? In other words should I license it under my Windows bootcamp setup or under my OS X setup. Either way I know I’ve got the horsepower (mid 2011 MBP 15″ 2.2 i7 with Radeon 6750 1GB). If there is no difference I’d prefer to go with OS X for the ease of gaming then going back to working without a reboot. Plus it gives developers an incentive to start giving us more OS X native games. It really isn’t worth it with any Mac with a discreet GPU that currently ship as they all have high performance with the game but people with older chips might consider it if their performance is under 20-30fps. The advantage lies of Windows lies in how Direct X has more direct access to the hardware compared to OpenGL. Both OSes have their own advantages but both do well at most tasks, including games. The Mac has built in OpenCL which boost performance in many tasks for example. Your card should run the game beautifully on Os X and you probably wouldn’t notice the difference, especially on a 15″ monitor. Blizzard lists it as pretty much the same requirements as Starcraft II, which the Nvidia 9400m handles just fine at lower settings with 4GB of RAM. Performance on the Intel 3000 should be somewhere between the 320m, which is rated as “medium” performance for the game and the 9400m chip and the more RAM, the better. be able to run Diablo 3? I am needing to buy a new comp and would like to know if these specs would cover it. Any help would be appreciated. Thanks! I am going for a budget system with an intel core 2 duo 2.9gb cpu and a gt210 GPU. Even though its not listed i’m pretty sure the card is supported. MacBookPro 17″, early 2008, with Intel Core 2 Duo 2,66ghz, 4 GB RAM & NVIDIA GeForce 8600M GT (listed as low). Do you think I can get good fps with this at low settings? Question…will I be able to play D3 with this set up from my machine? What is the cheapest card that is in the ‘High’ category? Where would the GT 630M fit in? will my AMD e-450 APU w radeon Hd 1.65 GHz be able to play d3? Looking to play this on my mac (looks to be in the “high” category :D ) Will I be able to play online with my friends who will be playing on PCs? Yes, Mac and PC versions play on the same online realm. Hi, my Macbook Pro is Mac OSX 10.6.8, 2 GHz Intel Core i7, 4 GB memory, and AMD Radeon HD 6490M graphics card. Will Diablo 3 play on my mac? Check the system requirements against this list! I have all the specified requirements on my mac, BUT i have OS X 10.6.6, im don’t have that much knowledge of the OS’s effect on gameplay. Will my OS being ok to play with, or is the updated OS important? Will this laptop work and how well will it work? Looking for someone more knowledgable to tell me if I can run D3 on my MacbookPro. Dan63, I have this MBP aswell and I can tell you that it runs on low-medium details. It’s playable but do not expect much. I have 8GB of Ram, but don’t think that would make muh of a difference. I am using roughly the same system except it has 8GB RAM and Intel HD Graphics 3000 512 MB (So 13″ late 2011 MBP). Will the few MB extra video memory and the extra RAM make much difference? Man, I was happy as a puppy in elevator, when I saw my old and trusty GeForce 9500M GS in the LOW section !!! YOU sir (Min Tan) have made my day!!!!!! Is it fit for diablo 3 ?? is this enough to play Diablo 3 or do i need something more? I’m looking into some computers to choose from for Diablo 3. I’m wondering if this one in particular could run it. Btw, I have looked extensively into the operating systems and the Video Cards required but have seen no AMD Radeon 7000 model cards or quad core processors listed. and quadro fx 600..these 2 graphic cards supported diablo 3 ? Will my VTX3D ATI Radeon HD 2GB 5450 DDR3 PCI-E 2 1 VGA run diablo 3?